Specificity converts. In marketing, there should be no such thing as a general message. The marketer communicates with an aim. This aim should dictate everything else we say. This aim should influence, even constrain, every word we say. Specificity converts. A specific offer to a specific person will outperform a general offer to a general person. 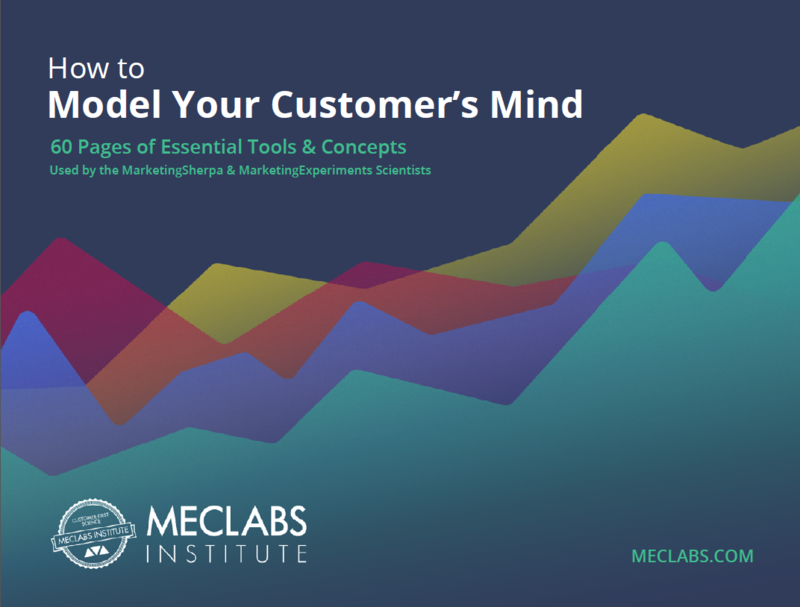 This concept relates to a recent email test we ran with our MarketingSherpa audience and ran again (with a slight twist) with our MarketingExperiments audience. First, in case you’re not familiar with MarketingSherpa, allow me to briefly explain our sister company. MarketingSherpa’s content is geared toward exploring general marketing principles. This is also where companies and marketers can share specific marketing stories, such as Mellow Mushroom’s social media strategy and Red Bull’s content marketing advice. Alternatively, the MarketingExperiments audience delves more specifically into the tactics of marketing strategy. MarketingExperiments is about specific tests that the reader can apply to their own marketing. Now that you understand the difference in content related to the tested audiences, let’s get into the test itself. 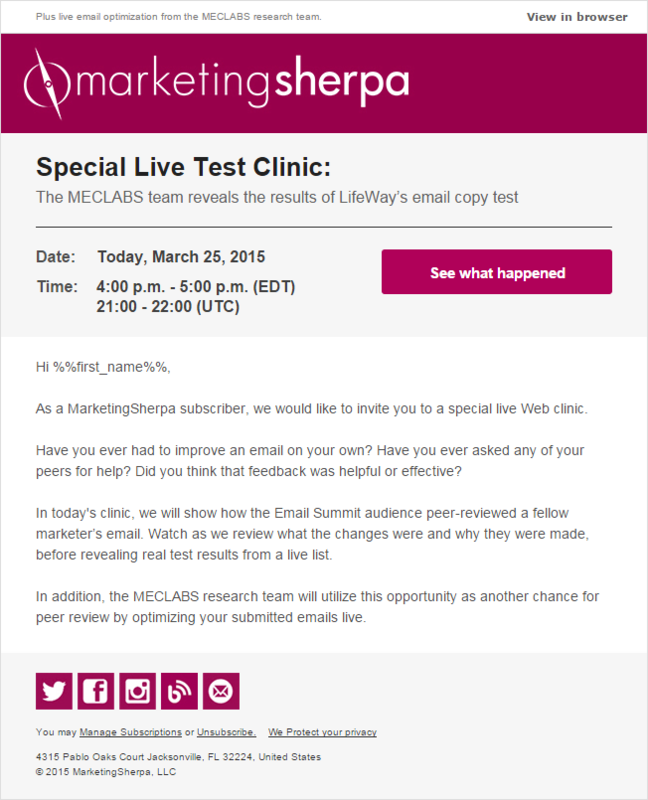 We tested an email invitation for a recent follow-up Web clinic MarketingSherpa hosted. 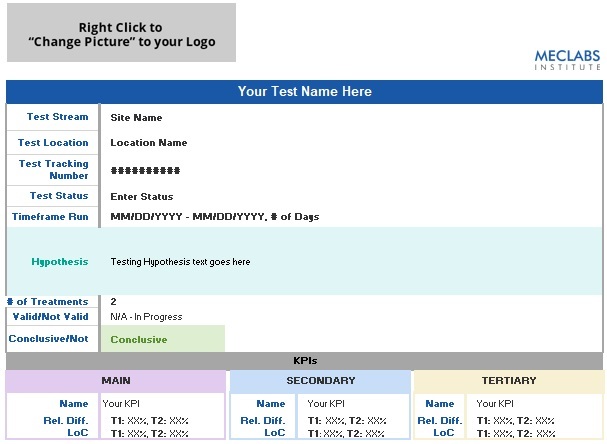 The clinic’s objectives were to examine the results of a live optimized email test, which was run by the MarketingSherpa audience at Email Summit 2015 alongside Flint McGlaughlin. Treatment A focused on the Email Summit follow-up test, only mentioning live optimization from the MECLABS team. Treatment B switched the emphasis by focusing on the live optimization from the MECLABS team, only mentioning the Email Summit follow-up test. In essence, both emails were an invite to the same Web clinic and messaged the same two offers, just with different expressions of focus. Preheader: Plus live email optimization from the MECLABS research team. Preheader: Plus, see actual results of the live email optimization from Email Summit 2015. Let’s take a look at some of the results. First off, Treatment A (Email Summit follow-up) outperformed Treatment B (live optimization) by a relative 11.97% in open rate. This was the expected result because the MarketingSherpa audience is very familiar with the MarketingSherpa Email Summit. They have likely seen promotional material for the event, or they may have even been one of the attendees in the audience giving live feedback. Furthermore, the MarketingSherpa audience does not usually focus as much on live optimization as the MarketingExperiments audience. Therefore, the offer of live optimization in the subject line would not perform as well compared to a more relevant and familiar term (Email Summit). To further prove the point of relevance, we ran the same test on the MarketingExperiments audience. How did you differ from your MarketingSherpa peers? The MarketingSherpa event is not as relevant to you, and live optimization is something that MarketingExperiments Web clinic attendees are very familiar with. As you can see, this is a very different reaction compared to the Sherpa audience. These tests, in conjunction with their different audiences, help to shed light on the power of the specific offer to the specific person. The specific offer alone is not enough. It must be communicated to the right audience. However, what happened next in our test, we did not expect (which is part of the fun in testing and the scientific method). When we looked at the clickthrough rate for the MarketingSherpa audience, the email focused on live optimization surprisingly outperformed the Email Summit follow-up. Now, before I go further into this test, let’s discuss the giant red box in my graphic above. The level of confidence is 79%, which is not enough to statistically say there is a significant difference. However, based on past MECLABS email tests and the strong open rate, if our numbers were slightly larger, this test would be valid. So yes, the big caveat here is that it is not statistically valid. However, for the sake of gaining an insight and for the sake of the rest of this article, let’s pretend this level of confidence is 95%. 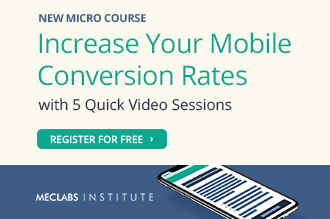 How would the live optimization email outperform the more relevant Email Summit 2015 email? Keeping this in mind, let’s think of the goal for both the MarketingSherpa and MarketingExperiments audiences: to get better at communication, at marketing, at our jobs. Now, let’s remind ourselves of the goal of the subject line. The goal of a subject line is not to sell someone on a product while they are looking at their inbox. It is simply to avoid the inherit process of elimination and be opened. With those two concepts of selfish desires — the consumer’s desire to open emails that benefit them and the marketer’s desire to have their emails opened — the most relevant offer, the one that made the most sense in their inbox, was opened. For the Sherpa audience, this was the more-relevant MarketingSherpa Email Summit 2015. For the Experiments, audience, which is used to live optimization and specific insights, using the term “live optimization” held the most relevance, thus securing more opens. Once the Sherpa audience actually opened and read the live optimization, they saw the value of live optimization. 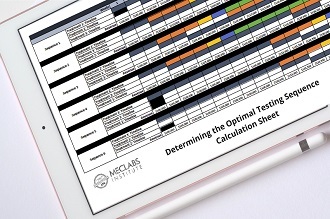 The value proposition of live optimization from the MECLABS team was communicated briefly in the email, and the goals of the Sherpa audience drove recipients to seize the opportunity of gaining live feedback, with the hope of possibly improving their individual performances at work. The emails’ open rates performed the way they did because that is what each relative audience was expecting and what each audience was used to. Once the live optimization email was read, an exciting new offer (or product) was communicated with its own unique value. This offer outperformed the Email Summit 2015 follow-up message — the stipulation being that the prospect needed to have the new offer communicated properly. In the meantime, the most relevant offer (open rates) would prevail. So what can we learn from this test? If you are going to unveil a new product or offering, communicate it in a familiar way. In short, imagine if the two MarketingSherpa treatments were combined. The most powerful email would likely have been a relevant subject line to get the open rate, coupled with the new offer communicated in the body of the email.